Rap fans listen up!! We’ve got an epic lineup coming soon to a venue near you – it’s G-Eazy, Ty Dolla Sign and Lil Uzi Vert on the Endless Summer Tour! 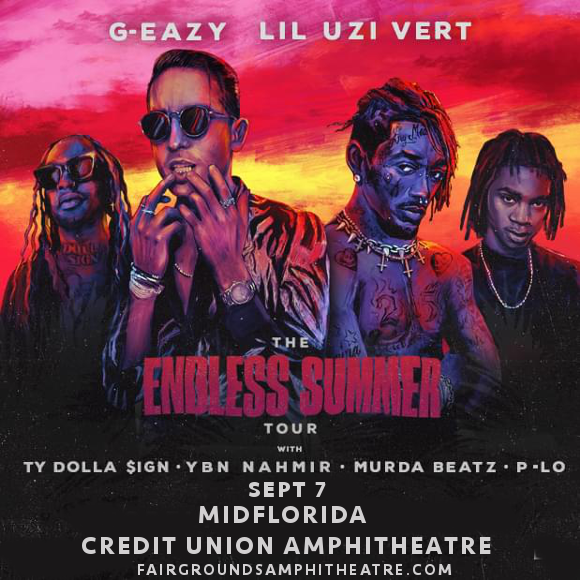 Coming on Friday 7th September 2018 at the MidFlorida Credit Union Amphitheatre! Tickets are on sale NOW for one of the hottest shows of the year – get yours while they last!! Hitting the top of the Billbaord 200 in its first week of release, and going on to achieve Platinum certification, it’s no wonder that Lil Uzi Vert’s debut full-length album is causing a stir in the rap world an beyond. ”On Luv Is Rage 2, he smashes his obsessions into a magnetic, lyrically verbose persona that comes off like a bouncy, chipper Looney Tune with a Tumblr page,” raved a Rolling Stone review “No matter the producer… he challenges them to keep up with his dynamic energy; and indeed, the production here is the best of his career; completely gassed-up and bright.” As for G-Eazy, he released his third album, the star-studded “The Beautiful And Damned,” in December 2017 to universal critical acclaim. This concert promises to be truly epic – don’t miss out!! Watch the trailer for the upcoming tour below, but don’t wait too long to make up your mind, as the tickets won’t last long! !